97% natural hair therapy. 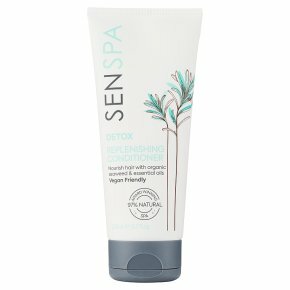 With organic seaweed & essential oils of sweet orange, lemon & rosemary.Senspa Replenishing conditioner combines organic seaweed with a blend of shea butter, olive oil and dead sea salt to re-moisturise your hair and help restore strength. Organic argan oil, rich in vitamin E, and a micronised wheat-based protein, nourish both the hair and scalp to improve shine and growth. Your hair will be left smoother and healthier from root to end. Directions: Apply conditioner onto clean hair from roots to ends. Comb through and rinse thoroughly. For very dry and damaged hair, leave in for 5 minutes. For best results use with Senspa Deep Cleanse shampoo. Warning: For external use only. Avoid contacts with eyes. Should this occur rinse immediately with warm water.<br><br>Due to the high concentration of natural oils and botanicals, product may vary over time and from batch to batch, this does not affect the quality or safety of the product.